A holy light surrounds you. You have been healed for 100 points. The price on Prexus Server is around 5,000pp. I got one for 5,000 then 3 days later I saw one for 2,000pp. 77 Ranger Mecurio Vengancce, of The Test Server but my heart always belongs to Prexus. Average price on E-marr is 10-15k. Bought one for my 66 shaman. Love getting those exceptional heals for 200+. Funny thing, is it only heals my shaman for 200+, and everyone else in the group gets the standard 103hp... would this be considered a bug? No it isnt a bug. 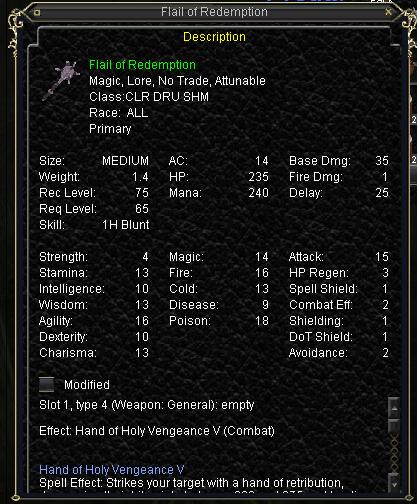 With my paladin's group heal weapons both hopebringer and blade of forgotten faith if i get an exceptional heal it only heals me for the double ammount and heals the rest of the group for the standard weapon proc amount. I think its just the way its coded into the game. Dropped from Diddle D and Witchkin both today. Named clockwork and named snake. I killed Witchkin a half dozen times and dropped the Flail of Redemption all six times. I have gotten this item to drop off of Witchkin, named snake from the same zone / area. Dropped off Diddle D in Dragonscale Hills today. It seems to lack the proc rate mod of the Time hammer, making it basically useless for uber cleric dps. I don't think it's broken... I think it was intended to have no procrate modifier, because Shaman and Druid can also use it. Watch out when you use this Hammer it has an AE proc of 200 range.